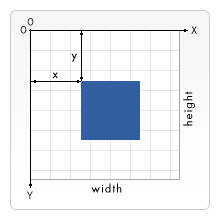 The Flotr2 library supports all major browsers including mobile, and can produce scatter plots, line plots, bar plots and pie charts. You then allocate a region of your web page where your graph is to be drawn. Typically this will be a div element. Here variable d1 is simply initialised to the [x,y] values directly, while d2 is set using a for loop calling the Math.sin() function. Lastly, you can call the Flotr2 library specifying the data series and the div element for display. The Flotr.draw() function can take a third argument that gives you control over exactly how the graph is drawn. This gives you control over the labelling of the axes, the minimum and maximum values drawn, whether data values are plotted as points or lines, and what plotting symbol to use. You can also control the colours and fonts. Look at demo9-1.html and demo9-2.html for worked examples. Refer to the Flotr2 documentation for further parameters and default settings. The Highcharts library supports all major browsers including mobile, and can produce scatter plots, line plots, bar plots, pie charts, boxplots and many specialised plots. Highcharts charts are very customisable. For a worked example, see demo9-3.html. Refer to the Highcharts documentation for full details. Using canvas graphics means that you take complete control of all the graphical elements: lines, shapes, text, images and their exact form and position on the page. Although this gives a lot of flexibility, it requires much more programming to achieve a simple graph. Only resort to canvas graphics if other means for meeting your requirements cannot be found. the canvas HTML element on the web page, with an id, width and height specified. the draw() function which is called from the onload event of the body element. inside the draw() function, we obtain a reference to the canvas object by its ID. from the canvas object we request the relevant graphics context for the canvas. we can now use the graphics context object ctx to draw on the canvas. You draw on the canvas by setting properties of the context object (such as the colours, line widths, font, drawing position) then calling methods for creating lines, rectangles and ellipses, or for drawing text. To set the colour and/or transparency of the rectangle, set the fillStyle property to the required colour. All the methods of specifying colours in CSS are supported. To draw a line requires a series of steps: (i) specify the line colour and thickness, (ii) start a new drawing path, (iii) move to the first point on the path, (iv) repeatedly specify the path from the last point to the next point in turn, (v) close the path (if required), (vi) request that the path be drawn or filled. The x and y values specify the centre of the circle and radius its size. The startAngle and endAngle parameters specify the starting and ending angles as measured the positive x-axis; angles are measured in radians. The final optional argument specifies whether the angles are defined clockwise (default) or anti-clockwise. To draw text on the canvas you can specify the font family, size, weight, alignment, colour and whether you want filled or outline characters. Filled text is drawn with the fillText() function, and outline text with the strokeText function. The filled colour is specified with the fillStyle property, and the stroked colour is specified with strokeStyle property. Refer to demo9-4.html for a complete worked example of canvas graphics. Implement "X-Y scatter plot with regression line" demonstration (demo9-1.html). Implement "Histogram bar chart" demonstration (demo9-2.html). Implement "Canvas Graphics" demonstration (demo9-4.html). You should aim to have a working version of your web experiment ready before next week's class. We will use the final class time to fix any last-minute bugs and to try out each other's experiments. You should also make progress on your coursework web site. You should have at least created a welcome page with a contents menu and a scientific background page. You could create empty "holding" pages for the rest of the content pages, maybe with a few notes about what is needed for each page.